This thorough rundown of polling covers both trend lines over time of Americans' opinions on climate and energy issues, as well as polling around specific recent events, such as support for and perceived impact of the April 2017 science marches, as well as reactions to Trump administration policies. Public support is greatest, at nearly 80%, for using revenue from a carbon tax to support the development of clean energy (solar, wind) and for improvements to American infrastructure (roads, bridges, etc). More than 70% of Americans support using the money to assist displaced workers in the coal industry, and 66% support paying down the national debt. Between 45% and 60% support reducing federal income taxes, assisting low-income communities most vulnerable to climate change, paying a climate dividend to all households in equal amounts, and helping all communities prepare for and adapt to global warming. Fewer respondents support reductions in payroll taxes (44%) and reducing corporate taxes (24%). Those who believe global warming is happening are 35 percentage points more likely to support the carbon tax, whereas those who do not believe global warming is happening are 25 percentage points less likely to support the carbon tax. The survey also analyzed respondents' "willingness to pay" (or the amount that Americans would, on average, be willing to pay in support of the described carbon tax) that people are willing to pay, on average, $177 annually, but that a US$10 increase in annual household cost from a theoretical carbon tax reduces the probability of support by 1 percentage point. We find statistically insignificant effects on the probability of support based on household size and the respondent's age, gender and years of education. We do, however, find statistically significant income and race effects. A $10,000 increase in a household's annual income increases the likelihood of support by 1 percentage point. Not surprisingly, Republicans, Independents, and those having no party affiliation are significantly less likely than Democrats to support the carbon tax, with magnitudes of 11, 20, and 18 percentage points less, respectively. More Republican voters are worried about climate change after massive hurricanes pummeled states including GOP-heavy state Texas, Florida and Louisiana. 57% percent of Republican registered voters said they were concerned about climate change and its impact on the environment, up 7 percentage points from April. 67% voters polled said they were concerned about climate change and its environmental impact, although concern among Democrats and independents actually dipped (7 and 4 percentage points, respectively). When asked about the contribution of climate change to recent natural disasters, such as the hurricanes that impacted parts of Texas and Louisiana, 61% of voters — including 52% of GOP voters — said the changing climate had at least some impact, while 21% believed it had little or no impact. 52% of registered voters believe that climate change is making natural disasters more frequent, and the same percentage said climate change is making those disasters more powerful. Geography also appears to be playing a role in driving public sentiment toward a more hawkish view on the subject in the wake of Hurricanes Harvey and Irma. 41% of respondents who reside in the South said they were very concerned about climate change’s impact on the U.S. environment, up 8 percentage points from the spring survey. The rise of intense political polarization among the American public can be traced to the growth in negative partisanship, or a partisan’s intense hatred towards the opposing party that can even overshadow support for their own. In this way, Republicans may dislike President Trump but they’ll still vote for him to make sure that a Democrat loses. This can apply to policy, as well, where a person’s decision to support or oppose a measure may be rooted in what brings more anguish and disappointment to the other side. In a climate context, negative partisanship can translate into conservatives who espouse climate skepticism – even though they may be negatively affected by its consequences – in order to inflict losses upon hated political enemies like Al Gore or environmentalists. However, negative partisanship is not solely constrained to the right and liberals may also fall prey, such as through blanket demonizing the Republican Party. Americans (including high-level Congressional staffers) underestimate how many of their fellow citizens believe in climate change. But one group is prone to overestimating: Republicans who believe in climate change are overly optimistic about the number of other Republicans who also believe. In general, people tend to believe public opinion on climate is more in line with their own beliefs. Indicating the potential value of correcting these beliefs, the study also found that telling Americans the true level of Chinese belief in climate change (98%) increased their support for the 2014 US-China climate agreement. Hear a discussion on the study at the 20:30 mark of this Energy Gang podcast. Only 22 percent of respondents believe the federal government spends too much on protecting the environment. Nearly two-thirds of Americans oppose cutting funding for the Environmental Protection Agency; programs that reduce pollution in low-income and minority communities; and the National Oceanic Atmospheric Administration, providers of forecasts and early warnings about dangerous weather and natural disasters. The strongest support for these safeguards and programs—and opposition to cutbacks—is from Democrats and Independents. But a sizable number of Republicans, more than one-third in most cases, also oppose them. A majority of Americans (76%) support net energy metering (NEM), a policy that allows small-scale producers of renewable energy (e.g., through rooftop solar panels) to sell excess power back to their electric utility. Support for NEM is highest among self-identified liberals and younger Americans (aged 18-49), two groups that also are more supportive of increasing the use of solar energy in their state. Even so, a majority of political moderates, conservatives, and Americans 50 and over also say they support NEM. While 80% of respondents who do believe there is solid evidence of climate change say they support NEM, even a majority (64%) of respondents who don’t think there is solid evidence of climate change say they support NEM. Democrats are eight times as likely to favor action on climate change as Republicans -- one of a handful of issues where the divisions between Republican and Democrats are widening -- including: gay marriage, gun control, and Black Lives Matter. By a 16-point margin, Americans in "Trump counties" (ones where President Obama won in 2012 but Trump won in 2016 or where Trump performed at least 20 points higher in 2016 than Romney did in 2012) oppose him "pulling the United States out of the Paris climate change accords with other nations" (48% oppose vs. 32% support). Opposition is much more intense than support, with 37% strongly opposing Trump's decision compared with 20% strongly supporting it. What can we learn from companies about how they win the "battle for our attention" to transform civic engagement from a hobby to a habit? Smart communications can help channel interest or outrage into civic action, that becomes a way of life for new and more experienced activists. A few recommendations: Make it timely, personal, and high-stakes. Inoculate against misinformation and spend time finding common ground. Expand perspectives through experiences. Give people tangible actions to take. Avoid blaming losses on external factors beyond people’s control. Encourage people to form alliances that create and grow power. Stop scaring people about climate change. It doesn't work. Focusing on worst-case climate change impact scenarios can do more harm than good when engaging people around climate, as our brains can in effect shut down if we determine a threat is insurmountable. That's the main message of this brief review of applicable psychology research, written in response to a New York Magazine piece outlining climate change's worst possible impacts. Over half (58%) of Americans understand that climate change is mostly human-caused, the highest level since this ongoing survey began in 2008. Other key findings include that 67% "rarely" or "never" discuss climate change with their friends and family, just 13% understand that nearly all climate scientists are convinced human-caused climate change is happening, and providing a better life for our children and grandchildren is the most popular reason (24%) why Americans want to address climate change. See coverage in Vox. The Climate Convening Toolkit shares the essential elements for effective public conversations on climate change, as well as the practical tools for planning and implementing a convening in your community. For a free download of this resource, follow the link. Fewer than one third of Americans support Pres. Trump's move to withdraw the U.S. from the Paris climate accord, and 52 percent think withdrawing from the agreement will hurt the U.S. economy in the long run (compared to just 18 percent who say it will help the economy). In this poll conducted one week after Pres. Trump made his announcement, 51 percent of Republicans said they support the U.S. withdrawing from the agreement, while 69 percent of Democrats oppose it. Although 47% of U.S. adults consider climate change to be a “very serious” problem (and 28% consider it a “somewhat serious” problem), they still see it as a long-term one, and have trouble connecting it with current events, such as shifts in seasonal weather patterns and sea level rise. A recent paper from the American Psychological Association posits this reaction is a result of the interaction between two of our cognitive systems, analytic reasoning and associative risks. While the anlaytic reasoning system understands climate change is a serious problem, our associative system fails to send the proper warning signals in the brain to those who do not (or cannot) experience the dangers of our changing planet. Further, there are two process that protect us from information we do not want to believe or do not want to have to act on: denial (saying climate change isn't real, and therefore they don't want to think or hear about it) and rationalization, where we come up with reasons for justifying inaction or supporting the idea that the threatening information won’t be so bad. Additional coverage in Paste Magazine. U.S. voters seek out information to confirm their political desires -- not just their beliefs -- according to a recent study during the 2016 election where people asked which candidate they wanted to win the election, and also which candidate they believed was most likely to win. Each participant then read about recent polling results emphasizing either that Mrs. Clinton or Mr. Trump was more likely to win. Those people who received desirable evidence — polls suggesting that their preferred candidate was going to win — took note and incorporated the information into their subsequent belief about which candidate was most likely to win the election. In contrast, those people who received undesirable evidence barely changed their belief about which candidate was most likely to win. Importantly, this bias in favor of the desirable evidence emerged irrespective of whether the polls confirmed or disconfirmed peoples’ prior belief about which candidate would win. Additional coverage in the New York Times. This resource is not publicly available. Please contact the authors before sharing its findings outside of the Lab. 61% percent of Americans said the country should stay in the Paris agreement, while just 17 % supported withdrawing and 21% unsure. 59% said the climate is changing as a result of humans’ burning fossil fuels, industrial farming, and deforestation, compared to 21% who said climate change is not linked to human activity, and 6% who argued the climate hasn’t changed at all. 51% said the U.S. is not taking a leadership role in addressing climate change, and 58% said it should. 20% said the U.S. is leading the charge, and 22% said it ought to take a backseat role. Another 29% weren’t sure where the country stood, and 20% remained undecided on what kind of role the U.S. should play. People turning out to recent marches in Washington, DC on climate and other issues are 1) overwhelmingly people who voted for Hillary Clinton, 2) well-educated, 3) 25-30% first-time protesters, 4) broadly motivated in response to the Trump administration, but 5) increasingly diverse in their specific reasons for marching (racial justice, the environment, women's rights, etc. ), and 6) continuing to show up to multiple marches. Those are the initial conclusions from sociologist Dana Fisher, who has been surveying march attendees at DC marches since the November election. Most Americans believe in and are worried about climate change, but not enough to overcome the political polarization that surrounds climate change in American society. That's the core conclusion of this piece which draws on public opinion information from a number of recent polls. 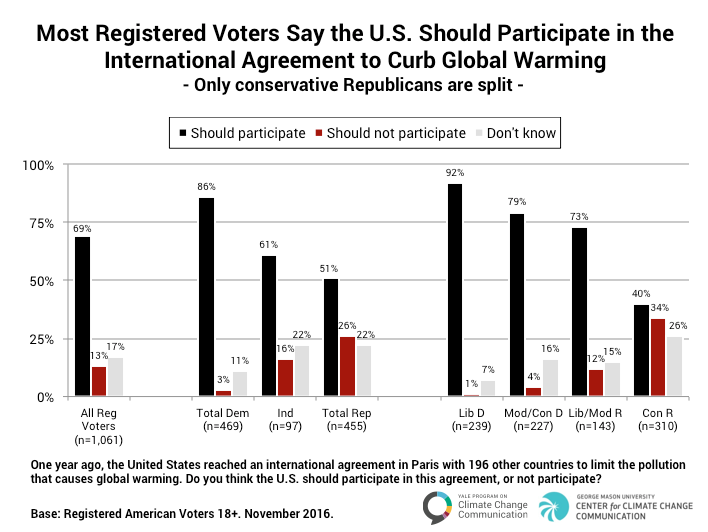 This nationally representative survey conducted after the election found that seven in ten registered voters (69%) say the U.S. should participate in the COP21 agreement, compared with only 13% who say the U.S. should not. Majorities of Democrats (86%) and Independents (61%), and half of Republicans (51%) say the U.S. should participate (including 73% of moderate/liberal Republicans). Only conservative Republicans are split, with marginally more saying the U.S. should participate (40%) than saying we should not participate (34%). 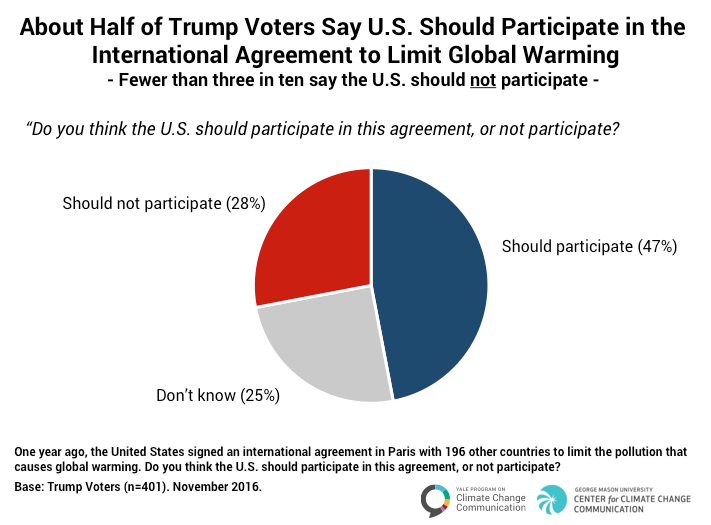 Almost half of Trump voters (47%) say the U.S. should participate in the Paris agreement, compared with only 28% who say the U.S. should not. 66% of American voters are "very concerned" or "somewhat concerned" that climate change will affect them or a family member personally, and 62% of voters say that Pres. Trump should not remove policies aimed at combating climate change, according to this national poll fielded March 30-April 3, 2017. 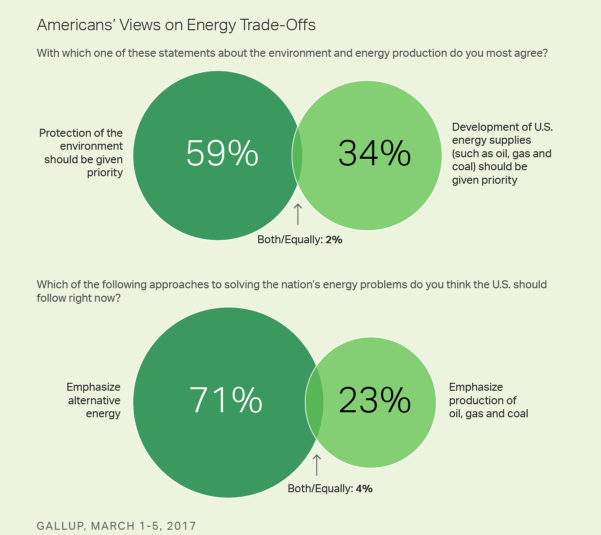 92% of voters say it is "very important" or "somewhat important" for the United States to be energy independent, and 65% say that climate change is caused by human activity. See coverage in Time. Two-thirds of registered voters said they are "very" or "somewhat" concerned about “climate change and the impact it’s having on the U.S. environment.” Only 26% of respondents said they were “not too concerned” or “not concerned at all.” Half of Republican respondents were concerned about climate change, while 44% were not. There was an even split among those who voted for Trump in last year’s general election, with 47% worried and the same number not. 38% of respondents said they believe Trump’s executive order (calling for a review of the Clean Power Plan and ending an Obama administration moratorium on new coal mining leases on federal land) would help the economy, while 28% said it would hurt the economy, and 20% said it would not make much difference. The rate is similar for independents, but nearly double the number of Republicans (62% believe the order would help the economy. 54% of respondents believe the order would hurt the environment, more than quadruple the number who said it would help the environment. (Another 22% said it wouldn’t matter either way.) But among Republicans, less than a third (31%) believe it would hurt the environment and about a fifth think Trump’s order to reduce rules on emissions would actually help the environment. 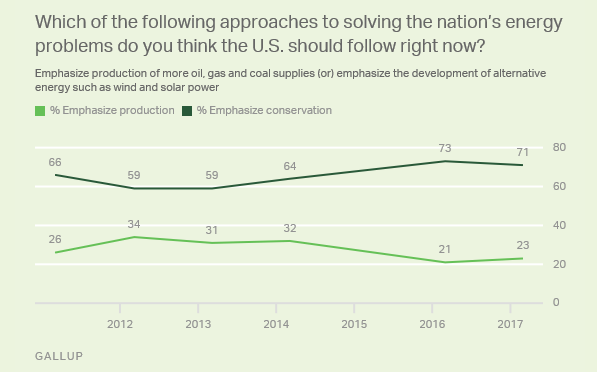 Across many different environmental issues, there is broad public support among Americans for the environmental safeguards that the Trump administration is rolling back, as outlined in this thorough summary of recent polling and survey data. 55% of Americans support remaining in the Paris Agreement; 49% say the EPA should fund climate research (vs. 28% declaring the opposite and 23% who are unsure); 57% say the EPA should continue to fund the Energy Star program (vs 19% who support defunding and 23% who are unsure). 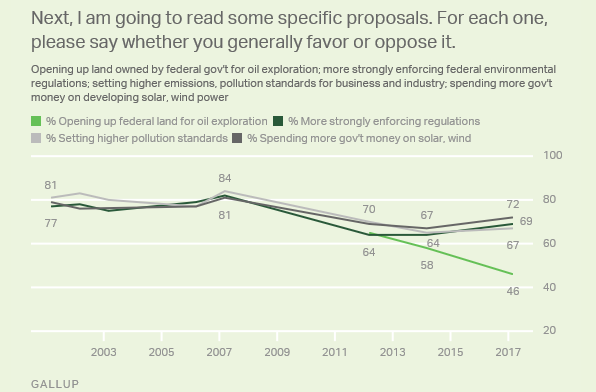 Opinions were more mixed on how much regulation is necessary, with 28% arguing the current level of regulation is too low; 26% saying the level is about right, and 23% agreeing with the president’s view that it is too high. Additional coverage in the Huffington Post. The majority of Floridians think that human-caused climate change is happening. And most of them—around three out of four—are concerned, according to a recent nonpartisan poll conducted by the Saint Leo University. When asked “How concerned are you about global climate change,” 75.5% of Floridians responded in the affirmative—that they were either somewhat or very concerned, on par with the nationwide average of 75.1%. Among Florida residents, 77.1% believe human activity fuels climate change, and 13.2% blame nature, and less than 10% believe climate change isn't real. A new poll shows rising public concern about global warming and an increase in public agreement with scientists on why it's happening. According to Gallup, "68% of Americans — the highest Gallup has recorded — believe increases in Earth's temperatures over the last century are mainly due to the effects of pollution from human activities." Currently, 45% percent worry a "great deal" about global warming, a 13-point jump since 2015. Support among Americans for a carbon tax hit a new high (50%) just before the November 2016 election, and that level of support increased when survey respondents were told the carbon tax revenue would be used for either an income tax rebate (62%) or research and development for renewable energy programs (66%). Support decreased to 42% when respondents were told the revenue would be used for deficit reduction. Also, roughly half of the respondents who said they support each carbon tax option said they "strongly support" it, according to the survey from the National Surveys on Energy and Environment. A new study suggests scientists' perceived credibility does not decrease with higher levels of public advocacy on a range of issues, contradicting the assumption that scientists will be less respected if they speak out on policy matters. Credibility suffered only when advocating for the specific policy of building more nuclear power plants to address climate change, suggesting that what scientists advocate for matters -- not that they should rule out advocacy altogether. More coverage in the Washington Post. (1) Participants were very distrusting of elites, large institutions and corporations so it is more effective to amplify trusted local, non-elite voices and emphasise the ‘will of the people’ where there is majority support for a policy or issue. (2) Special places and landscapes are valued, but human relationships matter more, so use messaging which speaks to that shared sense of pride in who we are as a people, and which reflects that belief and optimism. (3) Protecting the purity of the family and our environment was a prominent theme -- and technology was as much a threat to this purity as pollution. Therefore, be careful in the promotion of new technologies as part of the solution. (4) Climate change was not tangible or ‘front of mind’ for participants, so it is important to anchor campaign messages by foregrounding recognised, tangible, localised issues, such as reducing air pollution. (6) It is important to be honest and open about the benefits and challenges of making the shift to renewables. Ensure messages are moderate and balanced in the claims made for renewable energy. Big claims about the transformation of energy systems may backfire. Renewable energy draws increasing Republican support. That could shift climate politics. This piece argues that Republican support for clean energy policies could shift the climate discussion in the coming years, as more and more conservative communities in the Midwest see themselves as the clean energy heroes in the climate debate, rather than the villains. Snapchat has 200 million users, half of whom are daily active users, and is also the fastest growing social media platform, reaching about 41% of all 18-34-year-olds. Step-by-step recommendations for how organizations can leverage Snapchat as a platform for engaging their members in advocacy campaigns: 1. Send supporters the Snapchat info for your target. (The Public Affairs Council keeps a list of Congressional Snapchat accounts.) 2. Give them ideas about what to put in their snapchat (e.g. a personal story, a photo of a sign they made for last weekend’s protest, a photo from right outside a district office) 3. Tell them to send it right to Congress! 4. If your organization does have an account, have supporters snap the photo to your acount too, to help keep track of contacts. 5. Since the platform is inherently less formal than any other social media platform, so be sure to lighten the tone in your messaging. Social scientists have identified 5 main barriers to understanding climate change: distance, doom, dissonance, denial, and identity. To overcome distance: bring climate impacts close to home, connect issues that matter to your audience, and invoke "legacy." To overcome doom: emphasize solutions and benefits and beware of the overuse of emotional appeals. To overcome dissonance: channel the power of social norms and appeal to group identity. To overcome denial: understand different sources of doubt, don’t repeat the myth, and don’t overload with facts. To overcome identity factors: appeal to identity-based values and social norms. Watch the full webinar here. 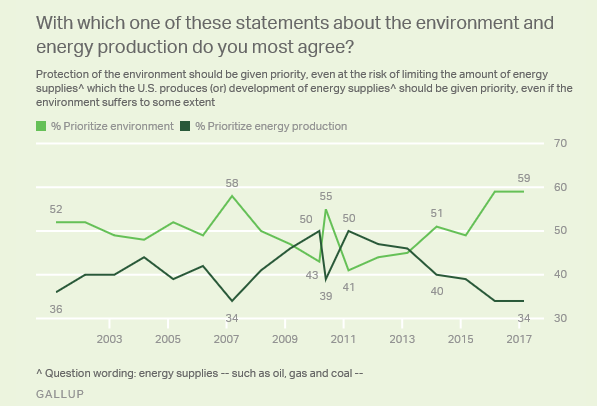 A majority of Americans (55%) now cite protecting the environment as a top priority, up from 47% in 2016. The widest partisan gap on any policy issue is on the importance of dealing with global climate change. 62% of Democrats say this should be a top priority for the president and Congress, vs. just 15% of Republicans – making climate change by far the lowest-ranked of 21 policy priorities among Republicans. Republicans have ranked global climate change – or global warming in surveys prior to 2015 – at or close to the bottom of the list of policy priorities for more than a decade. At the same time, the share of Democrats who rate climate change as a top priority has steadily increased in recent years – from 46% in 2015 to 62% currently. According to a recent nationwide poll this month, 65% of Americans prioritize developing alternative energy sources like wind and solar (up from 60% in December 2014), compared with 27% who prefer expanded production of fossil fuel sources. The survey also shows that Democrats are far more likely to prioritize developing alternative energy over fossil fuels, compared with Republicans. While 81% of Democrats and Independents who lean Democratic favor developing alternative sources over fossil fuels, Republicans and Independents who lean Republican are split, with 45% favoring development of alternative sources and 44% favoring expansion of oil, coal and natural gas. A thorough summary of polls showing that Americans have a better understanding of climate change, its causes and its impacts than Pres. Trump, and are more supportive of taking action to address the problem as well. More Americans (19%) are "very worried" about global warming than at any point in the last eight years, according to the latest survey (November 2016, post-election) in this series of national surveys. Other key findings include that a majority of Americans (61%) are "very" or "somewhat" worried about global warming, and that 76% of Americans think that schools should teach children about the causes, consequences and potential solutions to global warming. Strong majorities of Americans continue to support U.S. involvement in the Paris climate agreement (69%), setting strict limits on carbon pollution from power plants (70%), and expanding our use of renewable energy (81%), according to this post-election national survey from the Yale Program on Climate Change Communication and the George Mason University Center for Climate Change Communication. Half of registered voters (51%) think policies to transition away from fossil fuels to clean energy will improve the economy, while 27% think such policies will hurt the economy. Only 28% of Americans think climate scientists understand the causes of global climate change “very well”. Political ideology is the strongest predictor of this viewpoint: 54% of liberal Democrats say climate scientists understand very well the causes of climate change, compared with 11% of conservative Republicans. Just 27% of Americans say that almost all climate scientists agree human behavior is mostly responsible for climate change. 39% of adults trust climate scientists a lot to give full and accurate information about the causes of climate change. Yet despite their skepticism about scientists, 67% of Americans say climate scientists should have a major role in decision making about climate matters. Advocates have opportunities to fill the remarkable silence around climate change among those already engaged in the issue. Among the two thirds of Americans who are interested in global warming and/or rate it as important, fewer than half hear about it in the media once a month or more; only a quarter hear about it at least monthly from those they know; and more than half rarely or never discuss it with family or friends. Covered by Climate Nexus. A good summary of all the polling and surveys showing that Latinos consistently show higher concern about climate change and support for climate action. It also explores some of the likely reasons for this support, including that a) Latinos have stronger ties to people in countries feeling more direct impacts of climate change, b) Latinos are on average younger than other demographic groups (and surveys show younger Americans in general are more supportive of climate action), and c) Latinos perceive themselves as more directly threatened by the impacts of climate change. 83% of U.S. adults think climate change is happening, with 26% responding that it is "mainly due to human activities"; 13% responding that it is "mainly due to natural causes"; and 55% responding that it is "due to a combination of both human activities and natural causes." 38% of U.S. adults are "very concerned" about climate change (including 23% of Republicans) and 38% of "somewhat concerned" (including 34% of Republicans). 67% of U.S. adults think the U.S. should be producing "much more" wind and solar energy than we are today, with 22% responding "somewhat more." Solid majorities of Americans would support the Obama administration permanently protecting the Arctic and Atlantic from drilling and preventing the expansion of new leases on public lands and waters. Partisan and generational divides do exist, however, with substantial majorities of independents and Democrats opposed to leasing and millennials appreciably more opposed than seniors. Americans across all parties are exceedingly positive about increasing development of renewables and would like to see this as the country’s energy priority -- 93% of Democrats, 90% or Independents, and 84% of Republicans support expanding development of renewable energy sources. Americans have a host of concerns about continued fossil fuel development, with health issues chief among them. Two in three Americans say we should keep fossil fuels in the ground to help address climate change. 3 in 4 respondents said that it is a high priority to cut air pollution from energy production that has negative public health effects, including a slight majority of Republicans and 90% of Democrats. 7 in 10 said it is a high priority to reduce greenhouse gases from energy production, including just under half of Republicans and 91% of Democrats. After a briefing and assessment of arguments pro and con, 7 in 10 approved of the US participating in the Paris Climate Agreement. Overall, 7 in 10 favor the Clean Power Plan, including 2 in 3 respondents in states whose governments are challenging the CPP before the Supreme Court--though 7 in 10 voters had initially heard "just a little or nothing at all" about the CPP. The poll was fielded nationally from April-June 2016, with oversamples and state-specific results for OK, TX, CA, FL, OH, VA, MD and NY. “Start with people, stay with people”, “Connect on common values”, “Emphasize solutions”, and “Have at least 1 powerful fact from a trusted messenger” are among the 15 steps to crafting emotionally resonant, personalized, and effective messages on climate change. 95% of Americans want automakers to keep improving fuel economy for cars and trucks, while 79% want the government to keep increasing fuel efficiency standards, according to a recent survey. 78% also agree that “state transportation agencies should take vehicle-related carbon pollution and climate change into account when developing transportation plans, and also seek ways to reduce that pollution”. 75% of millennials say they would be more likely to vote for a candidate who wants to transition the U.S. from fossil fuels to clean energy, but 44% of millennials do not see a difference between Clinton and Trump on this issue. 44% also prefer Clinton’s views on transitioning to clean energy; only 12% prefer Trump’s. 81% of millennials identified "protecting our families’ health with clean air and water" as a high priority in the 2016 election. The EPA also enjoys strong support among millennials, with a net favorability rating (+36) higher than that of LeBron James (+29) and Beyonce (+18). Press release and topline results are also available. UPDATE: Tracking poll results from late August are now available. 80% of Hispanics consider global warming to be a "somewhat serious" or "very serious" problem, up almost 7% from a year ago, according to a survey from the Florida Atlantic University Business and Economic Polling Initiative. More than half (54%) said they considered global warming a "deciding factor" in who they would vote for to be president. A majority of Americans expect to go farther on a gallon of gas with their next vehicle purchase (53%). Even more (84%) believe automakers should continue to improve fuel economy for all vehicle types, though partisan differences emerge regarding support for the U.S. government increasing and enforcing fuel economy standards (60% support among Republicans vs. 80% among Democrats). Analysis of the patterns behind high-performing progressive advocacy campaigns that demonstrated both policy/cultural impact uncovered a common set of strategic orientations and practices. Campaigns in this group tend to share power and decision-making with their supporters, and spend significant time organizing and aligning their wider networks of allies. At the same time, they’re led by active central command structures that control resource management, framing, and storytelling, while also dedicating significant attention to political moments and media narrative work. Featured in the Stanford Social Innovation Review. 60% of Americans polled support EPA's new regulations on methane emissions from the oil and gas industry, including 75% of Democrats, 62% of Independents and 43% of Republicans. After hearing arguments for and against the standards, the level of support holds steady (59% of those polled). More broadly, 66% of Americans favor the EPA setting stricter limits on air pollution, including 86% of Democrats, 68% of Independents and 41% of Republicans.